A few weeks ago, we started a new project in my classroom: Kindergarten Around the World. I will spare you the minute details (hit me in the comments if you want to know more), but it is, basically, a virtual exchange between our class, and a partner class overseas. For my 20 Canadian munchkins, we found a partner group in East Borneo, Indonesia. 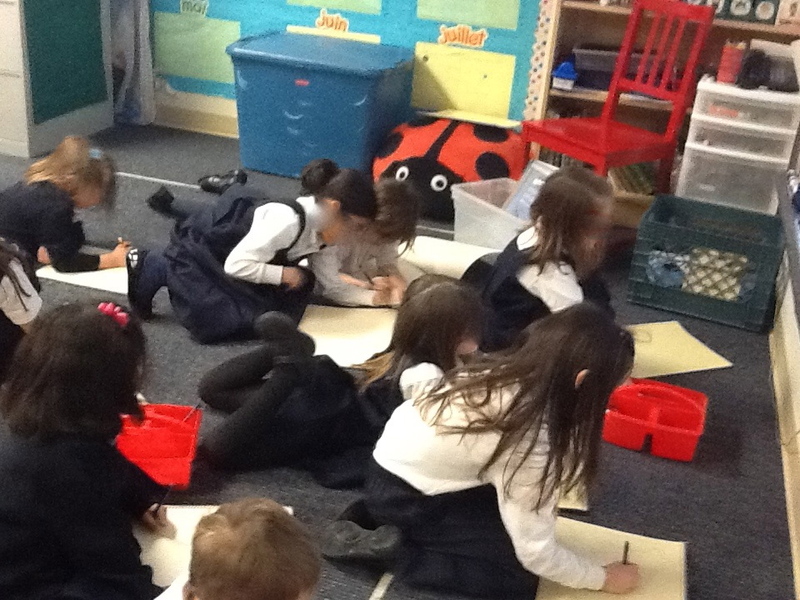 Both classes have created an imaginary friend, who attends our partner school. (For the curious, our imaginary friend is a little girl named Ella. She is 6 years old, she has blond hair, brown eyes, and brown skin. Her gender and name were decided by vote. Her age and appearance were drawn at random.) We use Twitter to ask research questions of our partners, and the answers allow us to write stories documenting our imaginary friend’s experience in another country. Each child has a journal for the project, where they record things they have learned. It being kindergarten, the recording mostly takes the form of drawings. The children dictate text to go with their drawings, and then copy that text onto their pages. We are working on a Prezi presentation to share our learning with parents and other classes. We have made a video to teach our “Indonesia friends” about snow and how to get dressed for recess when it is very cold. That a map is picture of a place, taken from up high, and helps us see where things are. That blue parts of a map are always water. That when we are at school, our Indonesia friends are sleeping, and vice versa, and that that is because the Earth is rotating, and Canada and Indonesia can’t face the sun at the same time. That voting is a fair way of making decisions as a group, and that just because something is “fair” doesn’t mean that everyone is happy about it. That orangutans eat more fruit than any other animal. That baby orangutans stay with their mothers for 6 years. That adult male orangutans live alone, but still visit their mothers. That orangutans can yell so loud you can hear them from 1.5 km away. That, shockingly, not only can kindergarten teachers be men (as we have learned from some other Twitter friends), but music teachers can be men, too. That in warm climates, many schools have outdoor swimming pools RIGHT AT SCHOOL, and that this is possibly the very coolest thing about Indonesia. That “temperature” tells us whether it is hot or cold, and that “weather” tells us what the sky looks like. Every single time we log in, we learn. And, then, today, we learned about tsunamis. What is a tsunami, Mme? It’s a big big wave, bigger than you can imagine, big enough to wash away cars and buildings. Is it dangerous? Yes, it can be very dangerous. Could we have one here? Probably not, because we live a very long ways from the ocean. Our Indonesia friends can see the ocean from their classroom, could they have one? Yes, it is possible that they could have one, but the people in charge in their country are watching carefully, and they will evacuate if it looks like a tsunami is coming. What is “evacuate?” If something dangerous like a fire or a tsunami or a really bad storm is coming, the police and the army will help people move to safer place until it is okay for them to go back home. Where would they go to be safe? They would go somewhere further away from the ocean, probably somewhere higher and drier, until it was safe. Can we tell them to come here? They are our friends, we can take care of them, they will be safe with us, and they could go to our school. There’s only 6 kids in their class, we have room for six more. Can we please tell them to come here…? I knew this project would be amazing. I knew it would make me proud. I knew my students and I would learn things I never expected, and that there is magic in learning TOGETHER. I didn’t know it would be the thing that made a faraway tragedy into something real. I didn’t know that it would leave me humbled by my students’ simple statements of generosity. I didn’t know how REAL those 6 little people, on the other side of the world, were going to become to my 20 little people. They are our friends. We can take care of them. They will be safe with us. We have room. I didn’t know that this project would lead me to think that the world might be a far better place if foreign aid and international disaster relief policies were written by five-year-olds. So here’s the (apparently controversial) scoop: My class tweets (well, in English, we “tweet.” In French, we “twitte.”) I set up a private Twitter account just for them. We follow about 12 different classrooms, scattered across the globe, and are followed by about 25 people — a mix of classrooms, teachers, and students’ own parents.We have been tweeting a few times a week since early January. I project our account onto our Interactive Whiteboard (IWB, the generic term for a non-Smart brand Smartboards), we check our messages, respond to any questions, and ask a few questions of our own. Our Twitter sessions last about 15 – 20 minutes. The kids dictate all of our content, and I type it. They LOVE it, and get worried if we go more than a day or so without checking in with our twitter friends. We tweet in English and French. Now that we have been tweeting for over a month, I could write an extensive list of all the learning (both expected and unexpected) that happens during and because of our Twitter sessions. As wonderful as that list might be, however, nothing on it would reflect what REALLY matters to me about using Twitter in my classroom. I honestly never planned for Twitter to be primarily a literacy/numeracy exercise. I wanted my class to be on Twitter because I knew what Twitter had done for me as professional. With my fellow kinderchatters, I feel part of a professional network that far exceeds the bounds of my own school, city, country. And THAT is what I wanted for my students: to see themselves as part of a huge network of children, kindergarteners, learners, and students, who all go into classrooms, have teachers, play games, sing songs, read books, play, giggle, and learn new things. I wanted kindergarten, as an experience, to exist for them beyond the bounds of our four walls. Our school, being an international and UNESCO school, commits to graduating “active, global citizens” and that begins with an awareness that there are children! in other places! who go to school! just like us! That, to me, is a powerful understanding. Already having a network of kindergarten teachers myself, I knew I could find us a handful of comparably-aged “tweeps” pretty easily. The format — short, succinct sentences — is well-suited to the attention spans and language skills of my 5-year old munchkins. Unlike live-chatting programs (both video and text), Twitter is very forgiving of time zones, last -minute schedule changes, and hiccups in our wireless network. I was comfortable with the degree of privacy and anonymity afforded by a protected Twitter account. And for this, most important goal, Twitter is working, and better than I had ever dreamed. We recently read the Ezra Jack Keats classic The Snow Day, which required me to explain the concept of school being cancelled due to snow (this did not compute in their western-prairie minds: we have snow, we have school. End of story.) Within 24 hours, one of our twitter class friends reported that they had just had a snow day. The exclamations of: “Snow days really happen! They are a real thing! Our twitter friends had one!” echoed off the classroom walls. When we watched the animated story of Martin’s Big Words on January 17th, and our twitter friends reported that they had watched it, too, my students were proud that they knew about a man who was so important outside of our classroom, school, and country. They felt a part of a large group of children, their age, who had learned and talked about Martin Luther King Jr. They were proud to participate in the conversation. I was proud of them for being proud. In the name of full disclosure: our conversations are not always about literature or historical figures. Being 5-year-olds, we also talk about Pillow Pets and Silly Bandz. We compare notes on rest-time rules, snack routines, classroom jobs, specialist teachers. They want to know the colour of the chairs in other classrooms, what others do for indoor recess, whether EVERYONE wears uniforms like we do, if their classrooms have windows, a sink, a coatroom. We learn about the weather, and that the seasons are not the same everywhere at the same time. We have discovered that EVERYONE has a 100th day of school, but that it doesn’t fall on the same day for all classes. We have proudly taught our Twitter friends the French words for a great many things. We have learned that some schools have a church on their campus, that some classes have only girls in them, that some kindergarten teachers are MEN!!! (This last being perhaps the most amazing discovery of all). Not too long ago, we followed a link to a Storybird story, written by some 4th grade students. We read the story, and used it as a jumping-off point to talk about real vs. imaginary. We then tweeted that class to share how we had used their work in a lesson. To quote one of my kiddos: “They will be proud that we used their work to LEARN! They were kind of our teachers today!” There was such power and also such humility in that moment. Tweeting is allowing my students to directly learn from and teach, other children, in a way that feels real and meaningful to them. They are aware of themselves as participants in a big conversation, and feel a sense of responsibility around contributing to that conversation regularly and thoughtfully. And that? Is a pretty huge thing to be happening, just 140 characters at a time. The children keep their own, hand-drawn maps, and add new twitter friends as we meet them. For a different viewpoint on the question of Twitter in kindergarten, please visit the lovely @jenwatson’s blog, here.